Arn Magnusson of Arnäs was born in 1150 to a noble family in the Kingdom of Western Götaland (in what is now Sweden). When he inexplicably recovers after falling from the parapet of his ancestral home, his mother promises him to the service of God so at the age of five he is sent to Varnhem monastery, where he comes under the tutelage of Father Henri, a wise and caring Cistercian monk, and Brother Guilbert, the monastery blacksmith and former Knight Templar, who finds the boy has an extraordinary talent with horse, sword, and bow. Arn becomes totally convinced that “his life belonged to God” and retains an unworldy innocence that at first makes him a laughing stock outside the monastery. But then circumstances force him into becoming a famous Knight Templar. 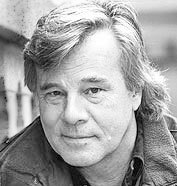 Jan (Oscar Sverre Lucien Henri) Guillou (1944- ) is a Swedish author who made his name as an investigative journalist. He worked on a communist magazine which he had co-founded, then in 1973 wrote a series of articles about a Swedish secret intelligence agency which led to him being accused of espionage and receiving a ten-month prison sentence. In 2009 he was accused of having been an active agent of the Soviet KGB between 1967 and 1972. He admitted having received money from the KGB but explained that it was part of a journalistic investigation. As a child, he had been expelled from two separate schools because of his bad behaviour that included physical abuse, theft and blackmail. He described his harsh treatment at school, and from his sadistic stepfather, in his semi-autobigraphical novel, Ondskan, although the accuracy of this has been challenged. He lives in Stockholm with his common-law wife. He had two children by a previous marriage. His novels include a spy series featuring Carl Hamilton (known as Coq Rouge) and the Arn series, forming the Crusades Trilogy, reviewed below. The Road to Jerusalem gets off to rather a slow start with all its information about the in-fighting and rivalry between competing nobles in 12th century Scandinavia. However, it really starts to come to life when very young Arn falls off a parapet and his mother promises that “If Arn were saved, the boy would be given to do God's holy work among human beings here on earth.” And saved he was, so, at the age of five, he was sent off to Varnhem monastery to be brought up by the monks. He could not help crying as he had to say goodbye to Eskil, his older brother, but he soon fits into his new life, helped by Father Henri who was determined to ensure that the boy's free will should not be broken. Arn grows up as a curious innocent, particularly determined to avoid the sin of pride, and quite ignorant of the ways of the world outside the monastery. Father Henri explains to him, “God had wanted to save his life for a future task, a great task”. And Brother Gilbert, the ex-Templar who had become the monastery blacksmith, teaches him to become expert with bow and arrow and with sword, and, as Arn is ambidextrous, realises what a formidable fighter he could become. The story is at its most interesting when Arn himself is firmly centre of stage; the historical explanations about the Crusades are less effective. Eventually, as a teenager, Arn is sent out to learn about the world and return to his father's estate. He leaves the monastery with a heavy heart. At first his innocence and naivety leads to much derision, not only from his father and brother but from his father's thralls whom he insists on treating as human beings. Then he starts to show them how they can improve their lives by introducing a host of ideas from a new sort of horseshoe to latrines, and from smoked ham to a new brickworks. He, for his part, is eager to learn about activities that are new to him such as hunting. And he finally proves himself in an exciting duel in which he stands in for his father. Then he falls in love with the beautiful Cecilia, whose sister had previously taken advantage of him while he was drunk, and at the age of 17 finds himself excommunicated and sent off to join the the Knights Templar in Rome. “For God and death to all Saracens!” swears Arn. And his adventures continue in books 2 and 3. 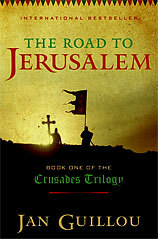 The Templar Knight follows Arn (now known as Arn de Gothia) to the Holy Land where he, most improbably, becomes the friend of the Crusaders' most feared enemy, the dreaded (but surprisingly friendly) Saladin. Through this friendship, and Arn's own study of Arabic (he can even quote the Koran), and his observations of the way that the Muslims around him live their lives, he finds himself increasingly at odds with the unruly behaviour of his fellow crusaders. Much respected by the Saracens, he is known to them as Al Ghouti. He becomes Master of the great Gaza stronghold and the champion of the Knights Templar, distinguishing himself in battle. Meanwhile at home, the mother of his son leads an unhappy life in Gudhem convent, and his son, unknown to him, is raised in hiding. But it is not until his twenty years penance have been served that he can rejoin them, and the book ends just before he starts on the journey home. Although the story gets off to a dramatic start, the pace slows down and the book is not only very long but seems it. Shorter chapters might have helped to make it more readable. The best parts are the battle scenes that are realistically and vividly described. Arn himself proves to be a talented leader and tactician even if the only real detective work he does is anticipating what the Saracens will do next. But in this he is remarkably successful, earning his reputation when, leading 400 Templar knights against an apparently overwhelming force of 5000 Saracens, he manages to rout them all. This makes exciting reading, unlike the over-extended description of life back at Gudhem, and the great chunks of Nordic background history that are lengthily explained. However some of the descriptions of life in the Holy Land are of interest, as when Arn in Gaza has to judge over a dispute about a horse which two men both claim. When each accuses the other of thievery, Arn "watched them for a moment with his sword raised, then he turned slightly and swung with the sword in only one hand, severing the horse's head. He jumped quickly away so as not to be kicked by its death throes or drenched by the blood spurting in all directions. Then he calmly wiped off his sword with a rag taken from under his tunic and slid it back into its scabbard, raising his hand to put a stop to all the noise from the crowd. The horse now had to be divided into two pieces of equal size, he explained. That meant that the man who was a liar would get half a horse in payment. But his punishment from God would be all the more severe. One man would get only half a horse even though he told the truth. His payment would be all the greater from God." Not exactly the judgement of Solomon, perhaps, but it seemed to make sense to the local people. But for horse-loving Arn (he can even speak to horses in a language they can understand), it seems just a little drastic. There are realistic descriptions of the religious sites in Jerusalem and of the in-fighting amongst the Crusaders, which, together with the sheer incompetence of some of their leaders, make the fall of Jeusalem seem inevitable. What is less convincing is the way that the almost sole survivor Arn accepts a role as adviser to Saladin. But he was never a character with whom it is very easy to empathise. Birth of the Kingdom describes the return home of Sir Arn de Gothia. Rich in gold, he is accompanied by a strong if mixed band of companions that includes both Christians and Saracens (whose beliefs Arn is always careful to respect. These Saracens include two Arab doctors who are able to save Arn's old father's life). After 20 years service fighting in the Crusades, Arn had finally been released of his vows and obligations athough he still retains the right to wear the white mantle with the red cross that marks him out as a Knight Templar. At first it is interesting to read how he meets up again with people like his old tutor, Brother Guilbert, his brother Eskil, and Cecilia Rosa, the mother of his son (whom he is at last able to marry) and, of course, he greets his son for the first time. Arn had “prayed to Our Lady that she might guide him and advise him in what he could and should do with all the power he had brought home ... and then for the first time ever, Our Lady answered the praying Arn so that he could hear her clear voice inside him and see her in the dazzling light that had just struck his face from one of the high windows in the little wooden church." And so he learned that “First he was to build a church that would be consecrated to God's grave, to show humanity that God was present wherever people resided and did not have to be sought by war or in foreign lands. The even bigger task She had given him was to create peace by building up of force that was so superior that war would be impossible." So he sets about building up a force of cavalry and making his home into a strong fortress, all with the single aim of achieving long lasting peace. But before this can be achieved there are battles to be fought, and, as in the previous books, these are vividly described with a real sense of excitement. But there are also numerous political machinations that seem to be described in unnecessary detail that makes the long book too slow-moving and sometimes distinctly tedious. It is as if the author is determined to tell us everything he possibly can and doesn't know when to stop. However, some of the lengthy descriptive passages are of interest as when he describes the "maidens' evening" and "bachelors' evening" that precede Arn's wedding. And real suspense builds up at the marriage of Arn's son to a princess of a rival tribe when treachery seems imminent. Arn himself proves “a stern and demanding new master” and surprises his servants “by hanging up his chainmail and all the blue finery and putting on the leather clothing of a thrall, even though he still wore his sword." And he is soon "working with the axe and draft oxen more than anyone else”. But when a party of guards, also made to join in the manual work, start complaining, he orders them, “When the sun has moved less than half an hour, I want to see all you guards fully armed on horseback out in the barnyard.” And then he tells them “You want to do the work of guards, which you find more worthy. And so you shall. Whoever can knock me off my horse will be excused. But anyone I knock off his horse will have to go back to cutting down pine trees!” And with that, he attacks all five of them with a heavy pine branch with which he has no problem knocking them to the ground. It makes him seem both cocksure and arrogant. He is never an entirely sympathetic figure.But perhaps he had good reason to be so confident in himself for in the Holy Land "he had certainly killed more than a thousand men with his own hands". But it turns out that even he cannot live for ever. Jan Guillou is described as a bestselling novelist, and it is claimed on the cover of the book that it is “destined to become a classic” but it's slow pace and rather ponderous style do not make this very likely. There is a very informative Wikipedia site, and more about the author's books on the kirjasto site. There is a site devoted to him which is in Swedish - but look it up on Google and they will translate it into English (of a sort). This is the first book of a trilogy following Arn's adventures. 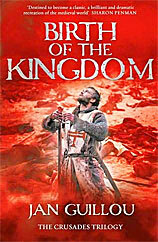 The cover image of the third book is from the Swedish feature film Arn - Knight Templar, available on dvd.